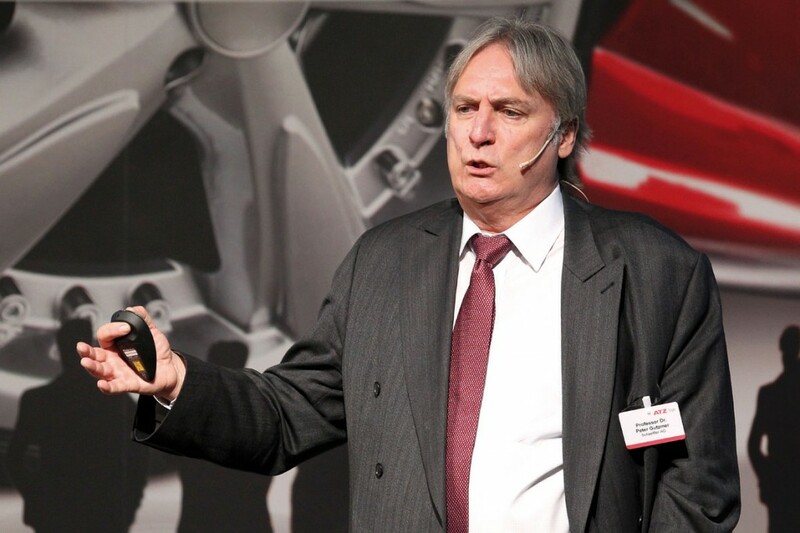 “The Drives of Tomorrow” was the theme of the MTZ’s 8th conference held in Wolfsburg. Engine developers and automotive engineers came together here to exchange ideas, with the main focus being placed on innovative solutions for tomorrow’s automobiles, which will be shaped by globalization, the availability of resources, and legislation on emissions. The automotive industry and its suppliers are working on solutions to these challenges. In addition to the increasing trend for electrification, the optimization of drive trains based on internal combustion engines as a complete system is also a focal point, as they are set to retain their dominant role in individual mobility. In his keynote speech “Enablers and Key Technologies for Efficient Small Engines”, Schaeffler CTO Prof. Peter Gutzmer addressed the conflicting priorities that have to be dealt with in modern engine development. „Small engines are both a marketable solution and a technical challenge at the same time. Smaller means less engine capacity and often fewer cylinders, less weight, and less friction – but above all, it initially means less comfort and inferior dynamics as well. These are the problems we have to solve“, Gutzmer explained. “The performance and the running characteristics that are prevalent today have mainly been defined by large-capacity engines with a high number of cylinders. In contrast, modern „rightsizing“ drives with innovative components are just emerging on the market.“ For instance, two-cylinder engines used in small cars, three-cylinder engines used in compact cars, and four-cylinder engines used in high-end cars all deliver respectable performance and are therefore increasingly in demand today. The trend for increasing specific engine performance is set to make significant advances here. The technologies and components playing the decisive role include variable valve control systems, turbocharging, increasingly complex thermal management systems, and a range of solutions for vibration damping. We also have the task of minimizing friction and reducing weight to a greater extent, and of considering all these individual factors together in order to achieve an optimized, holistic approach. The variable control of the valve train is a key technology for optimizing the combustion process. There is a range of individual solutions for this, which are specially designed to suit the relevant design features and requirements and are developed as modular systems. These range from variable cam phasing units and switchable valve train elements through to fully variable systems such as UniAir. Downsizing is a key trend that is accompanied by turbocharging, which is enjoying especially strong growth in gasoline engines. Turbochargers must be able to respond well and allow precise regulation, as well as requiring a high level of thermal stability, but modular approaches to manufacturing must also be taken into account from the start in order to allow them to be flexibly adapted to the engine and the vehicle. A further field of activity when it comes to the thermodynamic optimization the internal combustion engine is thermal management. Intelligent, processor-controlled modules for regulating the cooling circuit make it possible to shorten the warm-up phase and thus offer significant advantages, especially when it comes to cold starts according to the New European Driving Cycle. They also ensure that the temperature balance is precisely controlled and that the engine operates in the optimum temperature window. Downsizing and downspeeding initially mean a deterioration in the vehicle‘s NVH behavior and thus pose new challenges for the combination of engine and transmission. Balancer shafts in the engine can provide an improvement here. A further enabler for these engine concepts are damping elements used at the interface to the transmission. Schaeffler’s innovative centrifugal pendulum-type absorber, which ensures that the desired level of comfort is achieved for drive trains with both manual and automatic transmissions (double clutch and torque converter types) is effective here. Rotational irregularities in the crankshaft can also be reduced through the use of damping elements that employ the dual mass flywheel principle in the belt drive. The painstaking reduction of friction at numerous points in the drive train also makes a significant contribution to the optimization of drive trains based on internal combustion engines. Comprehensive knowledge and extensive detailed work are the key to achieving this. For example, surface technology that allows friction, consumption, and also wear to be reduced in a cost-effective way through the use of specific coating systems, provides an innovative range of options.